Western Maryland Hospital Center’s Comprehensive Care Program is licensed as a skilled nursing home unit and certified by Medicare and Medicaid. Your stay in our program may be planned for either short term or longer term depending on your needs. You can expect to be busy and may choose to participate in a variety of fun and challenging activities. Everything from crafts to ceramics or even enjoying computer game or on-line searches is available. Community outings for shopping and dining are frequently available as well. If your special needs require rehabilitation you may also be participating in physical therapy, occupational therapy or communication therapy. A resident in the Comprehensive Care Program is reviewed in their care plan conference at minimum every quarter and once a year. To find out more information about your care plan conference, you should talk with your case manager. The program has met all standards to participate in the Joint Commission’s Long Term Care Accreditation Program and has met all requirements of the Maryland Office of Health Care Quality. 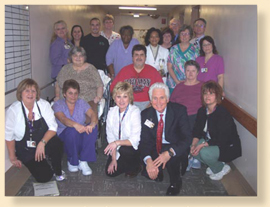 The Comprehensive Care Program is comprised of two distinct units within the facility. Locations include the first floor east wing (Skilled Nursing/In-patient renal dialysis unit) and the second floor east wing (long-term care ventilator unit).